This is oh, so simple, yet so tender and tasty, you’ll find yourself eating it before you get it to the bowl! In a dutch oven over medium heat, brown meat in hot oil. Remove seared beef from dutch oven. Add onions and stir with a wooden spoon until caramelized, scraping up any bits. Deglaze with wine until almost evaporated (optional, however it won’t be a Cabernet sauce). Add stock, Worcestershire sauce, garlic, bay leaves, rosemary, sea salt, honey, pepper, paprika, and cloves. 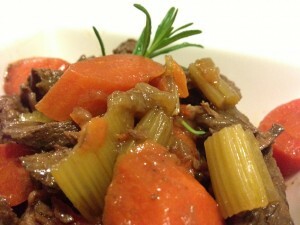 6 Responses to "Primal Beef Stew in Cabernet Sauce"
1. After adding the carrots and celery, did you leave the pot at simmer? I turned it up slightly above low, setting 3 on my range. 2. It took a good hour of additional cooking for the carrots to become tender and the celery still has a tiny bit of firmness to it. What had you intended for the consistency of the veg? It usually takes a good 40 minutes to soften up. Maybe your celery is cut too thick if it’s still not at desired texture. Could be. There was only a tiny bit of crunch to it, definitely didn’t impact the dish negatively. Thanks again! Glad you enjoyed it, let me know if you make any improvements!